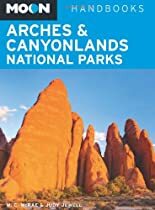 Seasoned travel guide authors W. C. McRae and Judy Jewell are back with an expanded look at Arches National Park and Canyonlands National Park. Packed with information on local recreation (including hiking, biking, rafting, and more), they provide detailed information on which sights should not be missed as well as how to best enjoy the scenery. From Island in the Sky District to Maze District, from Horseshoe Canyon Unit to the unrivaled beauty of Moab, Moon Arches & Canyonlands National Parks gives travelers the tools they need to create a more personal and memorable experience.